Located adjacent to the TD North Garden and the Zakim Bridge, this residential tower is at the heart of a neighborhood undergoing a dramatic urban transition. 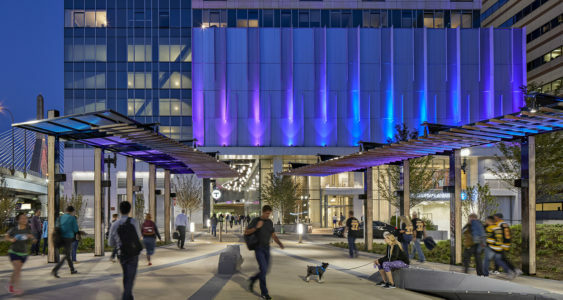 MYKD worked collaboratively with CBT Architects to develop a vibrant public realm that includes a civic plaza that connects visitors to this active environment. Within this residential development, private entrances were designed along a public walking path, creating a vibrant pedestrian space. A wooden canopy, custom benches, and distinct paving pattern accent the indoor/outdoor thoroughfare. 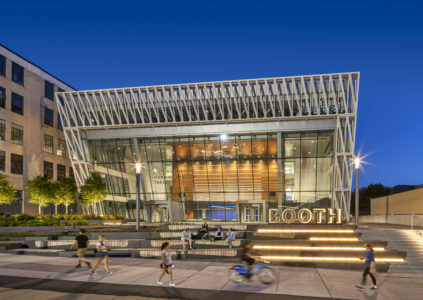 To accomplish the goal of relocating the theater arts back on campus, Boston University commissioned the design of the new Booth Theater and arts plaza. This modern performance complex will offer both indoor and outdoor opportunities for the performing arts, and can also be used as a seasonal outdoor event space. The stepped landscape celebrates the grade change and the building’s transparent façade, providing much-needed gathering spaces along Commonwealth Avenue for students. Custom planters and wood seating encourage flexible programming and enliven the streetscape. A new bike path is integrated into the road realignment. 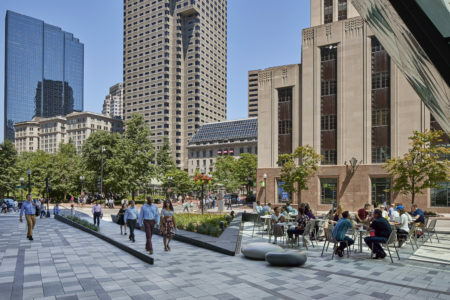 Located in the heart of Boston’s Financial District, this civic center re-envisions public space at the base of the 100 Federal Street tower. The plaza frames a glass atrium with kiosk spaces, winter garden and farm-to-table restaurants. Along the streetscape, a series of vibrant outdoor gathering and café spaces have been added overlooking Post Office Square. The project aims to enliven street life activity through all of the seasons and create a place that allows for flexible programming from day to night. 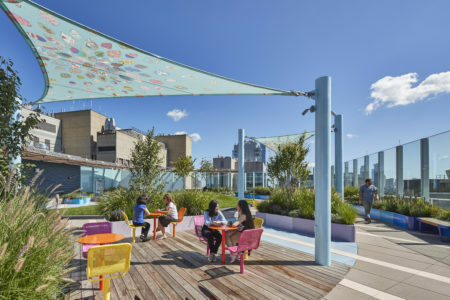 As part of the green master plan developed for Boston Children’s Hospital, MYKD is designing a series of healing gardens. 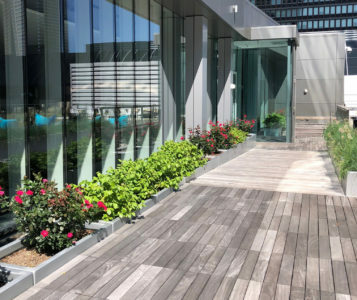 This particular rooftop garden is on the eleventh floor of the hospital’s main building. It provides 8,000 square feet of space as a refuge for children being treated at the hospital, their families/visitors, and the staff who care for them. The garden offers sweeping skyline and harbor views, a lush knoll for free play, diverse seating options, and lush plantings. Care was taken in the design to accommodate children who are immuno-compromised and those with disabilities. 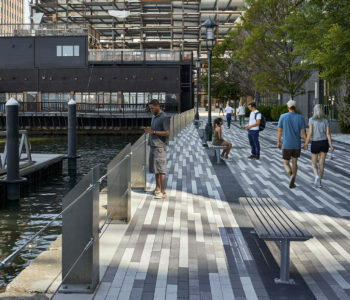 The Pier 4 Plaza connects to the Boston Harbor Walk and the Institute of Contemporary Art in the innovation district of the Seaport area of Boston. Inspired by the layered history of the site, the Plaza celebrates the linear movement of the historical railway tracks and new fiber optic and electrical linkages that define this landscape. The fluid and linear paving patterns highlight the flow of information and circuitry moving below the site. Framed by a large landscape area and a series of granite / stainless steel seating elements, the plaza transforms into an exciting and colorful gathering space during the day and at night.